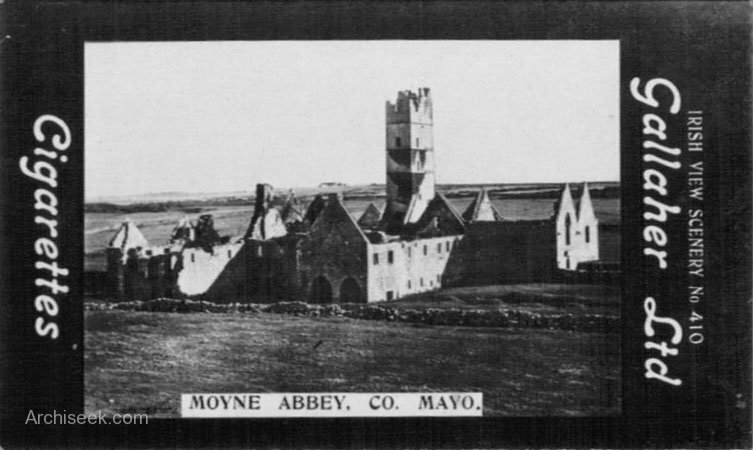 Moyne Abbey is one of most impressive ecclesiastical ruins in Mayo and a National Monument. It was founded by the Burke family as a Franciscan friary and consecrated in 1462. It is located north of Ballina on the west side of Killala Bay. It was burnt by Sir Richard Bingham, Elizabeth I of England’s governor of Connacht, in 1590 in reformationist zeal. The friary was built in the late Irish Gothic style and has extensive ruins, consisting of a church and domestic buildings situated around a central cloister. Its west doorway is a seventeenth insertion. Its east window displays fine switchline tracery.